Not sure if others think the same way about this, as I can’t find any articles about this online. Let’s say you’re into a niche and are doing great. You’re in the top 3 in Google, even number 1 for a long time now. Although you’re number 1, traffic declines for your homepage and those keywords. That’s what I like to call Ranking Fatigue. Ranking Fatigue is an indication of decreasing traffic for a website that’s number one in the search engines on at least one keyword for a long period of time for that particular keyword. Ranking fatigue can be influenced with a decrease of search volume for that particular keyword, for that period of time, enhancing the loss of traffic. The reasons for this can be very versatile. You’ll see this in niche markets more than bigger markets, where getting traffic is far more easier than building a strong brand, due to the lack of competition. In other words. Building a brand comes second for niche markets if it comes to grasping online market share in that niche. Is this an issue I should care about? If you’re into search, you should keep this in mind. After a long period of time, you will eventually have to deal with this challenge. you have a problem. Ofcourse, take in account the conversion rate and margin of the products that are getting sold by those visitors, in order to put this issue onto your marketing agenda. You detected a decrease for a certain keyword in your Analytics. Might seem like a no-brainer and it is. Just check the rankings of that particular keyword. Is it still at the same position? to make sure you’re not mistaken or biased by your focus on only that particular keyword. With the not-provided issue in Analytics, you have to look at the landing pages. you’re going to have a hard time to detect ranking fatigue. In this example, the decrease of volume was detected on the homepage. The homepage was targeted with one main keyword and ranked number one for several years in a row. * note: bias by first attribution of Google Adwords is possible in this example, although there was no detection of increase traffic via CPC for that particular keyword. Multichannel attribution reports with Analytics are not useful at this point because of their focus on leads only. This thing is about traffic for now. If so, just skip this possibility. Wipe it of the table. Your focus should be optimization at this point. Check Google Trends and set the period of time the same as the one you set in Google Analytics. * note: the numbers in Google Trends are normalized, so they give you a scale not an exact number of searches. January should be a bad month. March should be a good month. 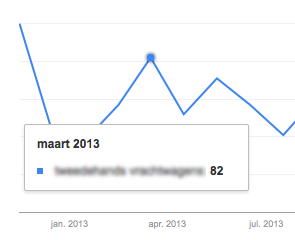 After that, the trends follows about the same like it does like the trend shown in Google Trends. Just before july, a little uplift, after that, traffics goes further down on that page (optimized for that particular keyword in mind). So for now… not sure if the trend is the cause of the decrease in volume. It shows, visually, a matching/correlating trend. Another option, the third option, is testing the dwell time for organic searches on that page. Dwell time was first introduced by Duane Forrester from Bing in 2011. In short: dwell time is the time spend on a page, where someone clicked on a search result and than goes back to the search engine result page. I hear you thinking, isn’t that Bounce percentage? Analytics needs to pageview interactions of pages on the same domain to calculate the time between pages. So you can’t use bounce rate because it isn’t 100% correct. The exit rate tells you more. But than again, if someone visits the page and stays for +15 minutes and leaves the site, you’ll have a high exit rate as well, although the visitor did stay long on the page. So… you’ll need a custom script. Something for Google Tag Manager for instance. If you’re not familiar with GTM yet, check the introduction video first. If you need any help, just contact me. Special thanks to Simo Ahava for this script.